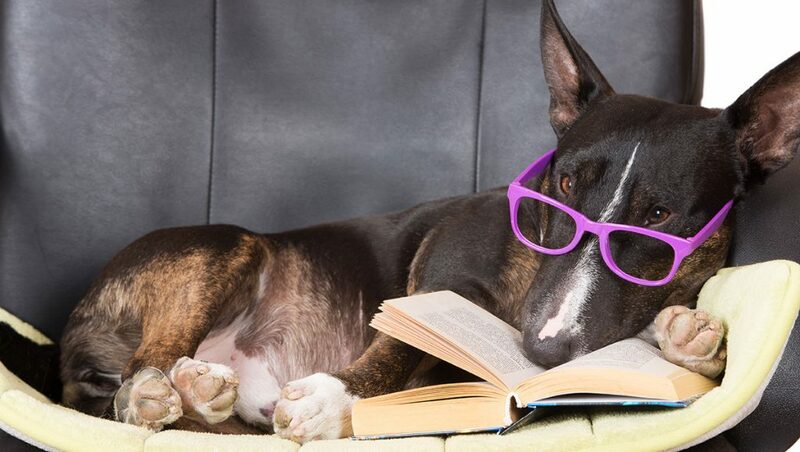 If you want to teach your dog English, you’ll love Stage 2 in dog training. This is the part where we build a bridge over the language barrier that exists between us. It’s the second stage in training a dog or puppy to carry out any new skill (the first stage is where we teach the dog what actions we are looking for). It’s all about helping your puppy make sense of what you say. Of pairing the action you have taught him, with the English word that will trigger that action in the future. There is a language barrier that exists between man and dog. Before we can begin to expect ‘obedience’ from a dog, we need to overcome that barrier. People and puppies have very different communication styles. People like to communicate using speech. Dogs, on the other hand, like to communicate through body language. At least in a limited way. Learning the meaning of a sound comes through repeatedly hearing that sound in association with a particular object or activity. If you say ‘dinner’ often enough whilst pouring food into his bowl, your dog will come to associate the word ‘dinner’ with being fed. How quickly your puppy comes to make this association depends partly on his natural ability to learn. Experiments have shown that this ‘pairing’ process doesn’t work so well if your puppy is stressed. The objective of this second stage in training is to build up an association, in your dog’s mind, between an action that you want the dog to perform, and the signal to which you want him to respond. Behaviorists usually refer to this signal as a ‘cue’. Dog trainers, especially traditional trainers, are more likely to call it a ‘command’. Traditionally, dog trainers would try and build this ‘association’ or understanding of the meaning of a word, at the same time as teaching an ‘obedient response’ to the new word. They would commence training a dog by giving a ‘command’ and then forcing or manipulating the dog into a particular position or action. For example, we used to say ‘SIT’ to a puppy, and then push his bottom into a sitting position. We might also have given a recall command ‘HERE’ and then reeled the puppy in towards us using a long line or lead. Eventually, the puppy would make an association between the action required and the activity that he was being forced into. But these methods had some disadvantages. It is actually very distracting to be pushed around physically. If someone pushed you unexpectedly into a chair, whilst saying a word you haven’t heard before, you might even feel quite annoyed with them. The chances are, you probably wouldn’t even remember hearing the word they shouted in your ear when they pushed you. You certainly wouldn’t leap into the nearest chair the next time you heard it. Unsurprisingly, most people resist if they are pushed. Their instinctive reaction is to push back. Dogs are just the same. And being pushed for no apparent reason is incredibly confusing. Young dogs and sensitive dogs can become quite stressed and even distressed by these traditional techniques. And learning can be quite a slow process. With a determined dog, it can develop into a battle of wills which one of you eventually loses. But with an anxious dog, it can cause a lot of upset. Modern dog trainers have therefore adopted a different approach. And that is what Stage Two ‘Pair It!’ is all about. It is a different way of thinking, and it has been shown to speed up learning in these early stages. In modern dog training, we build an association between our signal and the action we want the dog to perform, without touching him or pushing him around. We simply say the word, whilst he is carrying out the action required. And we do this over and over again until the connection is solid. Each time your dog runs towards you at the speed you say ‘HERE’, each time he sits in front of you, you say ‘SIT’. You are not asking or telling him to run towards you, you are simply offering him your word for that action. You are gently teaching him how to understand English. The crucial difference with this type of training is that you don’t ask the puppy, or tell the puppy, to sit. You don’t need to say anything to him at all! You simply describe for him, the position he is in, or the action he is taking. For example, as he moves into the sit position, by giving him your word. Crisply, clearly, and plainly. ‘Sit’. This enables him to learn and soak up this new language, free from distraction or confusion. Unlike the old method, it also ensures that your ‘signal’ word is never associated with any activity other than the action you require. Gently and without force, you are building an understanding of your verbal language in your dog’s mind. This whole process of understanding the meaning of a word is completed before we begin to use the word as any kind of signal, and before we expect any kind of obedience or response to it. It is the perfect preparation for Stage 3 ‘Teach It!’ The stage where you teach your dog to respond to a command. Stage 3 is so much easier to complete because you now make sense to your dog. How Do I Get a Dog to SIT If I Can’t Say SIT?? That’s a good question! If you need the dog to carry out the action of his own free will, you’ll be wondering how you get him to SIT or COME in the first place. There may be opportunities during the course of a normal day to practice some of our word associations, but others will need to be contrived or ‘set up’ . We use techniques such as ‘shaping’, ‘capturing’, and ‘luring’ for this purpose. You can read about capturing and luring in ‘three ways to teach your puppy to sit’ and shaping is covered in this article. Stage Two is about language. This is where you begin to teach your dog English. It’s the part of training where we teach dogs what the words and signals we use mean. We teach our dogs the meaning of a word or signal by pairing that signal with a particular action. Stage Two is built upon Stage One, much the same as Stage Two prepares the dog for ‘obedience’ which begins in Stage Three. Remember, Stage Two is about language, not obedience. Just ‘Pair It!’ and let your dog soak up the meaning of your words. Don’t forget to share your own dog training adventures in the comments box below!